In this paper, we study some semi-closed 1-set-contractive operators A and investigate the boundary conditions under which the topological degrees of 1-set contractive fields, deg are equal to 1. Correspondingly, we can obtain some new fixed point theorems for 1-set-contractive operators which extend and improve many famous theorems such as the Leray-Schauder theorem, and operator equation, etc. Lemma 2.1 generalizes the famous theorem. The calculation of topological degrees and index are important things, which combine the existence of solution of for integration and differential equation and or approximation by iteration technique. So, we apply the effective modification of He’s variation iteration method to solve some nonlinear and linear equations are proceed to examine some a class of integral-differential equations, to illustrate the effectiveness and convenience of this method. In recent years, the fixed point theory and application has rapidly development. That topological degree theory and fixed point index theory play an important role in the study of fixed points for various classes of nonlinear operators in Banach spaces (see [1-6]). We begin recall theorem A and lemma 1.1 . Then, several new fixed point theorems are obtained in Section 2, and the common solutions of the system of operator equations in Section 3. We also extend some examples for search solution of integral equation and integral-differential equation in Section 4 and Section 5 by variation iterative method. 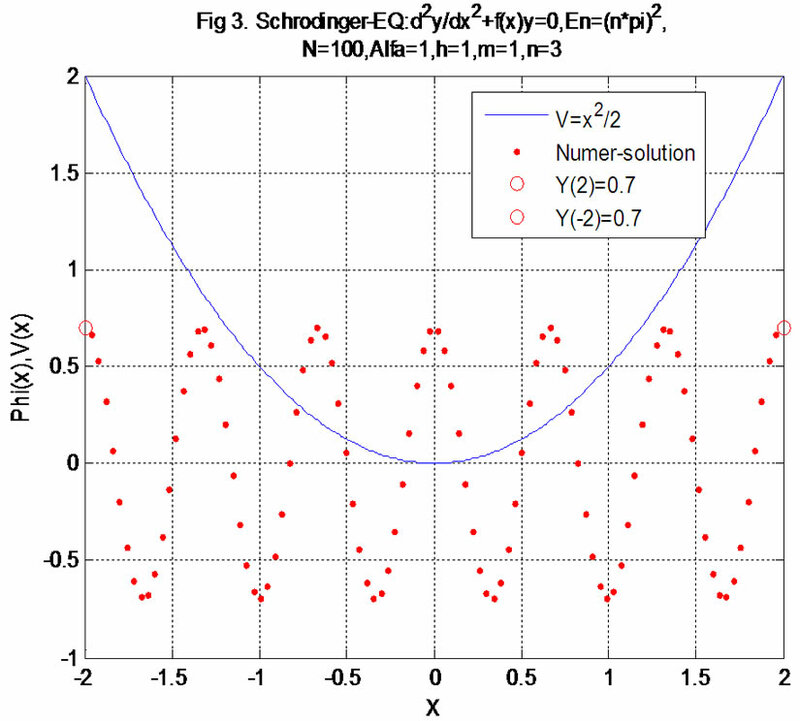 In last part, we compare some figures, by numerical test and note that simple case of Schrodinger equation. The main results are Theorem 2.2, Theorem 3.4-3.5, Example 3, Example 6, etc. If is a completely continuous operator, we have some well known theorems as follows (see [3,4]). First, we need following some definitions and conclusion (see ). For convenience, we first recall theorem A. 4) (Altman) , for all then , and hence has at least one fixed point in . Remark This lemma 2.1 generalizes the famous L-S theorem to the case of semi-closed 1-set-contractive operators. First, we state following some extend conclusion (see theorem ). Then if has no fixed points on and so has a fixed point in . Proof. By lemma 2.1, we can prove theorem 2.2. Suppose that has no fixed point on . which contradicts (2.2), and so the condition is satisfied. Therefore, it follows from lemma 2.1 that the conclusions of theorem 2.2 hold. Proof. Similar proof of that theorem 2.2.
which contradicts (2.3). Therefore, it follows from lemma 2.1 that the conclusions of theorem 2.3 hold. then (2.3) holds. By theorem 2.3, has a fixed point in . We get easy theorem 2.5 in bellow. So, extend (vi) of theorem 2.6 in , omit the similar proof. Then , if has no fixed points on and so has at least one fixed point in . (Let that is theorem 2.4 in ). We will extend Lemma 2 and Theorem 2, adopt same notation and method in  in following form. Let be a real Banach space, and -positive integer. Thus, Therefore, is a strictly monotone increasing function in .When we have and that is . where We complete the proof of this lemma 3.1. Then the operator equation has solution in . In fact, suppose that (3.2) is not true that is there exists a and an such that that is . That is then this is a contradiction to Lemma 3.1. Theorem 3.4 Let be a bounded open convex subset in and Suppose that are semi-closed. Then the operator equation has common solution in (omit the proof of this theorem). 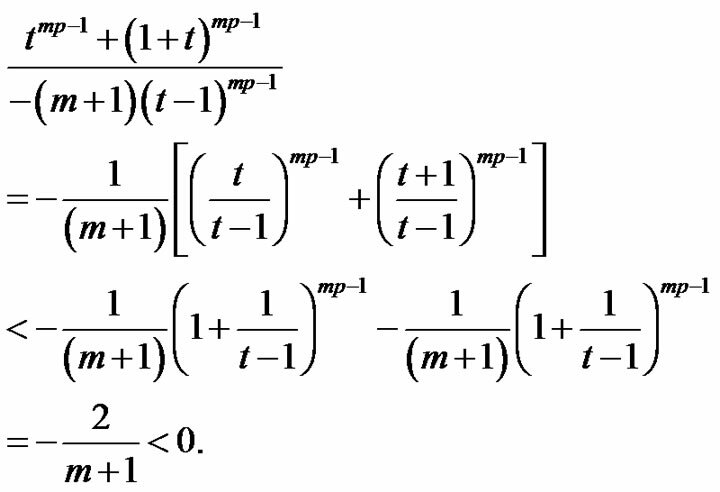 Then the operator equation has common solution in (omit this proof). Recently, the variational iteration method (VIM) has been favorably applied to some various kinds of nonlinear problems, for example, fractional differential equations, nonlinear differential equations, nonlinear thermoelasticity, nonlinear wave equations. Now, for to construct a sequence of successive iterations that for the for solution of integral equation (*). and then if the above iteration converges in the norm of to the solution of integral equation (*). then assume if the above iteration converges in the norm of to the solution of integral equation (*). The solution of integral Equation (4.1) by calculating as follows. and by Corollary 4.2, then if iterative sequence is convergent the solution of Equation (4.2). In this section, we apply the effective modification method of He’s VIM to solve some integral-differential equations. The variation iteration method (VIM) proposed by Ji-Huan He (see [5,10] has recently been intensively studied by scientists and engineers. the references cited therein) is one of the methods which have received much concern .It is based on the Lagrange multiplier and it merits of simplicity and easy execution. Unlike the traditional numerical methods. Along the direction and technique in , we may get more examples bellow. where In similar example1, we easy have it. Thus, then is the exact solution of (5.1) by only one iteration leads to a solution. Clearly, is evident exact solution of (5.2). The quantum mechanics theory and application in more field are widely important meaning. Along the direction and technique in  and , we may get more examples. where look in (6.3), that be the part in space for wave function , the in (6.4) be the potential function be arrange plank constant, be the practical mass, express energy. 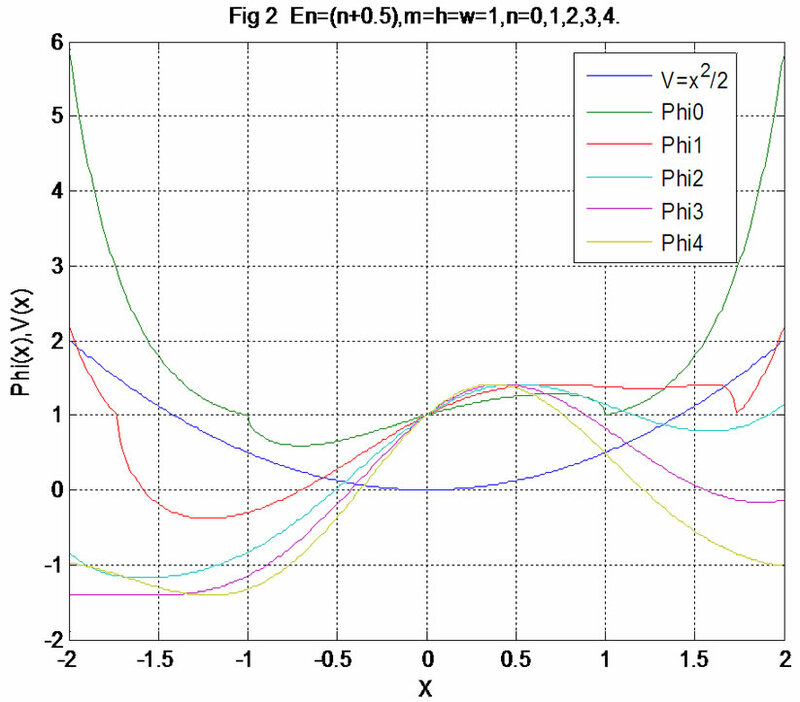 Therefore, by using of mathematical software with Matlab (see ), we may proceed numerical imitate, to get approximate solution, see Figures 3 and 4. Figure 1. The φ(x) is the space form of wave function φ(x.t) for (6.3) under action of shake V(x) = 0.5x2, by φ0, φ1, ···, φ4 express for 0-level, 1-level,···, 4-level wave function respectively. Figure 2. The ϕ(x) is the space form of wave function ϕ(x,t) for (6.3) under action of shake power V(x) = 0.5x2, by φ0, φ1, ···, φ4 express for 0-level, 1-level,···, 4-level wave function respectively. In fact, according to the finite difference principle, a one-dimensional Schrodinger equation can be converted into a set of nodal liner equations expressed in a matrix equation after the space is divided into a series of discrete nodes with an equal interval. The matrix left division command offered in the MATLAB software can be used to derive the function approximation of each unknown nodal function. Figure 3. 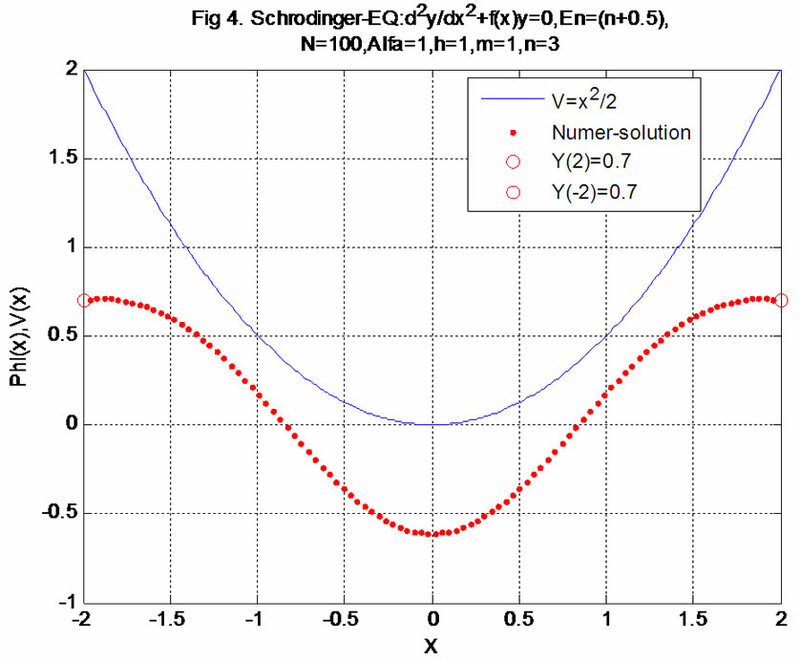 The φ(x) is numerical solution by action of (6.3) under the shake power V(x) = 0.5x2 and in boundary value condition φ(–2) = φ(2) = 0.7, the φ3(x) express 3-level (here step length = 0.04, the energy En = ((nπ)2, n = 3). Figure 4. 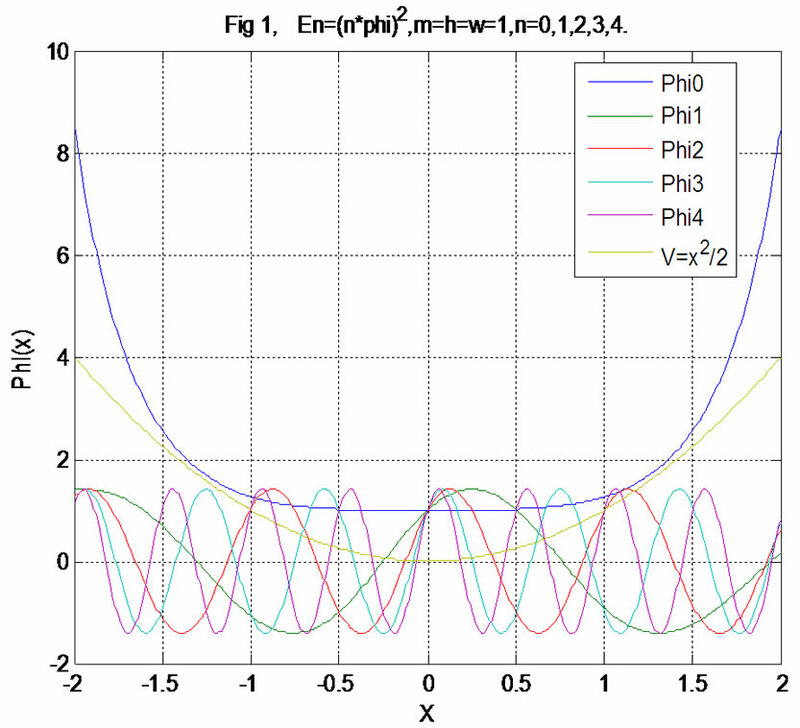 The φ(x) is numerical solution by action of (6.3) under the shake power V(x) = 0.5x2 and in boundary value condition φ(–2) = φ(2) = 0.7, the φ3(x) express 3-level (here step length=0.04, the energy En = ((nπ)2, n = 3). the variation iteration method to integral-differential equations, and extend some results in [3,8,10]. The obtained solution shows the method is also a very convenient and effective for various integral-differential equations, only one iteration leads to exact solutions. Recently, the impulsive differential delay equations is also a very interesting topic, and we may see  etc. In our future work, we may try to do some research in this field and may be could obtain some better results. This work is supported by the Natural Science Foundation (No. 11ZB192) of Sichuan Education Bureau and the key program of Science and Technology Foundation (No. 11ZD1007) of Southwest University of Science and Technology. The author thanks the Editor kindest suggestions, and thanks the referee for his comments.